David Wesley Griggs was born February 5, 1967 in Camden and grew up in Pennsuaken Township. His father Rocky was a postal worker and his mother Dolores was employed at the Air Force depot in Philadelphia. Bigger and stronger than most kids his age, David also had a mean streak. He was getting into fights as early as age 6, and by the time he began playing organized football, he was known as a player who would never back down. David’s older brother, Billy was a local gridiron star and David followed in his footsteps at Pennsauken High—where both played for Vince McAneney—and later the University of Virginia. He played tight end and defensive end. Both brothers were admired for squeezing the most out of their talent. Virginia’s football program in the 1980s was not known for its toughness. David, now a hard-hitting linebacker, changed all that. Playing beside Jeff Lageman, he gave the Cavaliers something of a reputation in the ACC. Lageman went in the first round in 1989, while David was selected by the Saints in the 7th. New Orleans cut David on the final day of camp. He signed on with the Miami Dolphins and got into 5 games as a rookie. That also happened to be Billy’s final year as a pro. He’d spent 5 seasons as a reserve tight end for the Jets. In 1990, David impressed Don Shula enough to win a starting job and helped the club go 12–4. Miami won its Wild Card matchup with the Chiefs before falling to the Bills 44–34. 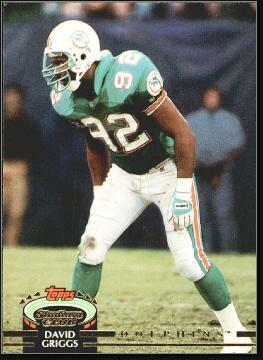 David spent five seasons with the Dolphins, and in his three years as a starter amassed 14 sacks. Prior to the 1994 season, he signed a free agent deal with the San Diego Chargers. He started alongside Dennis Gibson and Junior Seau, helping San Diego win the AFC championship. David played in the team’s 49–26 Super Bowl XXIX loss to the 49ers. He recorded three solo tackles in the game. That spring, a week after receiving his AFC Championship ring, David lost control of his Lexus on an off-ramp west of Ft. Lauderdale. The vehicle skidded across a grassy median before slamming into a sign pole. David died of head injuries sustained in the crash. He was survived by his wife, Amy, and baby daughter, Jasmine. His brother, Billy, is now a member of the coaching staff at Pennsauken High.